The procedure was rather straightforward: cook some sugar syrup, moisten the coconut with the sugar syrup, then cook up a lot of sugar syrup, and add that syrup, plus some frappe (or marshmallow creme) to the coconut. Mix it all together well, then spread into a 12×12-inch frame. Let set. Coat one side of the slab with bittersweet chocolate. When the chocolate sets, flip the slab and cut into 1-inch squares. Dip each square in tempered chocolate, add a little swooshy-swoosh flourish with a dipping fork, then sprinkle on a few strands of dessicated coconut. They looked great and tasted pretty darn good. I brought some into work and received a few “Fabulous! Tastes just like a Mounds bar!” comments. Yikes! If I wanted to present substandard, cheap confections to my colleagues I would have hopped across the street to CVS to get a sack of Fun-Size Mounds instead of spending much of my weekend and spare change creating coconut squares. 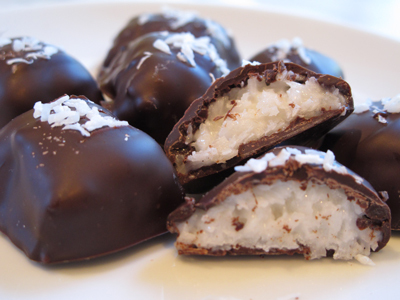 In the interest of understanding and perfecting my craft, I did a Mounds – homemade-coconut-square taste test. The coconut-filling taste was almost the same, but homemade had brighter flavor. The chocolate of Mounds bar was soft, not snappy, and was a dull, ugly brown with machine-engineered “waves.” And the chocolate has a wimpy flat taste. The chocolate on the homemade specimen, of course, had a beautiful shine and snap — and a rich chocolate taste. Not a big fan either way, though; I prefer rich, creamy, dreamy fillings. Wish I could remember why I chose to make these to begin with.